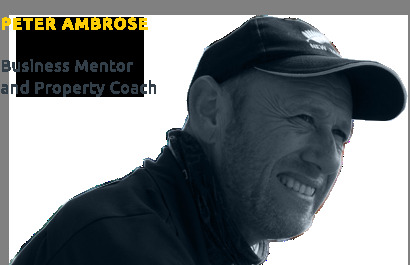 Limited spaces for property coaching available. Contact Peter today. Learn how to set up a successful property portfolio. Don't delay, contact Peter today. Read what Peter's students have to say. A passion for property and successful business. If achieving a successful investment property portfolio is your aim, I can help you with with my personalised one on one coaching program. With over 18 years of property investing experience and applying different strategies within the property cycle, I can teach you the secrets to success and more importantly, what pitfalls to avoid. If this sounds appealing to you, read more about my property coaching. Every accomplishment starts with a decision to try. Get ahead with your business and get inspired with my business mentoring program. Read more about business mentoring. It's all about enjoying the journey to setting and achieving your goals. Peter absolutely knows about property Investment, not only about purchasing houses but also different strategies. Peter always made himself available to help us if we needed support from him. I feel privileged to have been allowed to learn from someone whose values are so strongly aligned with mine and with so much knowledge and experience that Peter loves to share. Peter has taught us everything from buying and exiting strategies to being a supportive landlord, info on taxes, engaging with Councils and how to make the best returns on our investment. Original generation time 0.7827 seconds. Cache Loaded in: 0.0506 seconds.